This innovative portal invites readers into the darkened halls, small backrooms and travelling venues that hosted everything from spectacular shows and bawdy burlesque, to the world of magic and spiritualist séances. 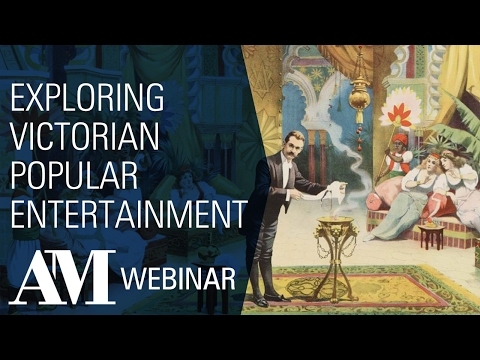 The Victorian Popular Culture portal is an essential resource for the study of popular entertainment in the nineteenth and early twentieth centuries. This is a wonderful resource that provides a wealth of material dealing with past popular media experiences, and is valuable for research and teaching purposes. During a time when the inter- and transdisciplinary are important tools of analysis, the Victorian Popular Culture Portal offers an assorted tapestry of examples that encourage the discovery and examination of the rich connections that exist between past and present forms of popular media. This resource contains a wide range of source material relating to popular entertainment in America, Britain and Europe in the period from 1779 to 1930, and shows how interconnected these worlds were. As well as fascinating primary source material in the form of objects, printed books, ephemera, posters, photographs and playbills, the resource includes a number of tools to support teaching and research. Rare books; periodicals aimed at industry and fans; hundreds of titles from the scarce popular series ‘Dicks’ Standard Plays’; posters and playbills; visual ephemera; and the marvellous archives of May Moore Duprez, the American music hall star who topped international bills with her ‘Jolly Little Dutch Girl’ act. Strongly visual in focus, featuring hundreds of posters, postcards, photographs, cabinet cards and illustrations. There are also handbills, pamphlets, manuscripts, printed ephemera and memorabilia. Rare books, children’s literature and memoirs of celebrity showpeople complete the wide-ranging selection. Remarkable video clips of original archive footage from the earliest days of cinema, from the renowned archival collections of the BFI National Archive. Material from the unique Harry Houdini Collection at the Harry Ransom Center, comprising a number of his fascinating scrapbooks, packed with details concerning the stagecraft of performers such as Houdin, Maskelyne and Dr Merlin, as well as providing insights into his disputes with Arthur Conan Doyle and leading spiritualists.